Hi everyone! Since this was an action-packed weekend, I will cover it in two posts unlike last week. So as you may have worked out from one of my previous posts and the title, I welcomed a visitor to keep me company for a few days. James-o! Yep, James from back home was on the tail end of a Scandinavian holiday, and luckily for me decided to swing by Helsinki for a few days. Excitement! He arrived late on Friday night, and so we really only did a bit of sitting around, catching up, before calling it a night. We had a bit planned for the weekend, so decided to hit the hay around the 1am mark. The plan for Saturday, after a slow morning, was to introduce James to Helsinki and for us to explore some places I hadn’t been to. So late morning we jumped on the bus and made our way into the city centre. Our first stop was to pick up some tickets we needed for the next day (you can read about that in the next entry), and then meander through the city toward the main harbour. We stopped by Stockmann to pick up some goodies for lunch and made our way to the harbour to the ferry terminal for our main destination. On our way we saw two fairly dodgy looking street performers. Darth Vader in particular was looking quite sad and portly, and they weren’t doing much but standing there as everyone ignored them. Time to get a better act guys! So James and I arrived at the Market Square ferry terminal. 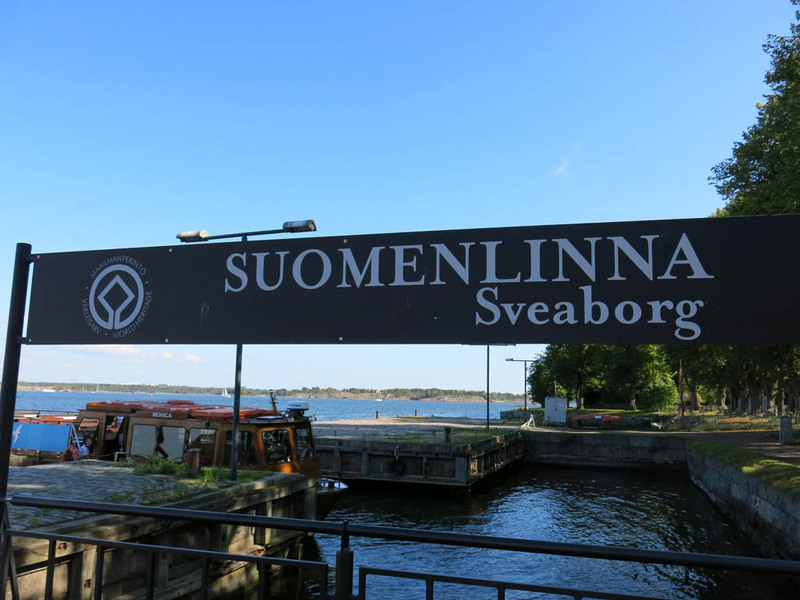 Our destination was Suomenlinna, a group of four islands about 15 minutes from the main ferry terminal. These islands are known as the fortress islands, for the obvious reason that in the 1700’s a series of fortresses were built, supposedly to protect Helsinki from a potential Russian invasion. Well, they were right about one thing… the Russian’s did come in the early 1800’s, but the fortress didn’t really do much to stop it happening. So they then became part of the Russian empire. Suomenlinna is now a Unesco World Heritage site, with many of the buildings still in tact and the islands dotted with canons. After about 15 minutes on the ferry, making our way past many of the small islands that surround Helsinki, we arrived at the main island. It was all then about wandering about, seeing the remaining fortress buildings and walls, and popping into the myriad cafes and shops (about 800 people live on the islands). So we wandered through the pink archway and started exploring. It was quite lovely to wander, with many people out and about enjoying yet another amazing Helsinki day. 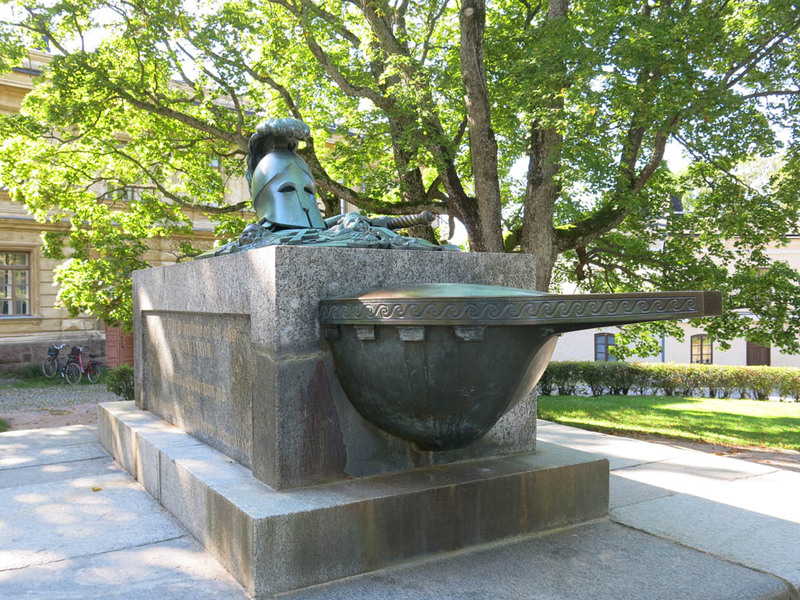 We came across a cool memorial, complete with Nordic helmet and longboat. 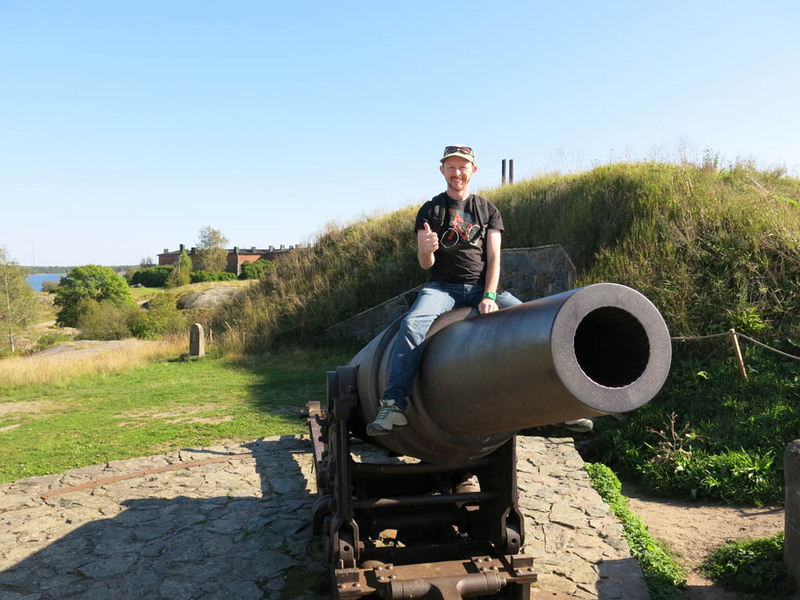 As mentioned, the island is dotted with lots of cannons on the site, of all shapes and sizes. This one I couldn’t resist having some fun with. It was great to wander, as the coast was glorious. It was kinda funny to see all the canons pointing out to a sea they clearly couldn’t defend. There was also much of the fortress wall still surrounding the islands too. We were free to explore and clamber much of it, which was a bit surprising for a Unesco site. But it seemed that it was ll still in really good nick, so clearly they weren’t too worried about any damage. At the opposite end from the main ferry terminal was the King’s Gate, a fairly modest entrance to the fortress furthest from Helsinki. There was also a small ferry terminal there, although not being summer, it wasn’t in use. Seems that outside of summer most of Helsinki slows down, even the tourist parts. On our way back to the ferry, we couldn’t resist a beer. It was nice to sit in the sun (albeit a touch chilly) and enjoy a couple of Saku’s, which I assumed would be the first of many over the weekend. So it was getting toward the end of the afternoon by the time we made our way back to the city centre. When we arrived we explored Helsinki some more, visiting Senate Square, home of the Government Palace, a pretty impressive building. Standing out front was Emperor Alexander II. On this afternoon he seemed to be attracting more pigeons than tourists. 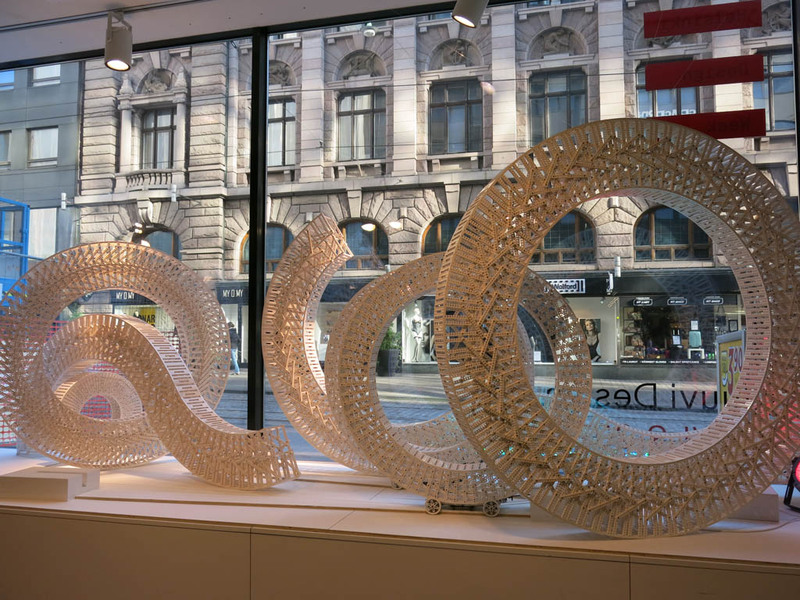 Helsinki, as I think I’ve mentioned, is the design capital of a very design-oriented area of the world. While we made our way back to the bus station, we came across an exhibition of sorts in a random shop. How did we notice it? Well, one of art pieces was a couple of very elaborate automated Lego creations. When you see some crazy lego in a window of course you have to go in and look! In the shopping centre that housed the exhibition, it seemed they have a bathroom clientele that was not just male and female, but bear as well. bears that really struggle to hold it in by the looks of it. scrabble with finnish letters is dang hard! Rather than head straight back to my apartment, we decided to find a pub to enjoy another Finnish beer. 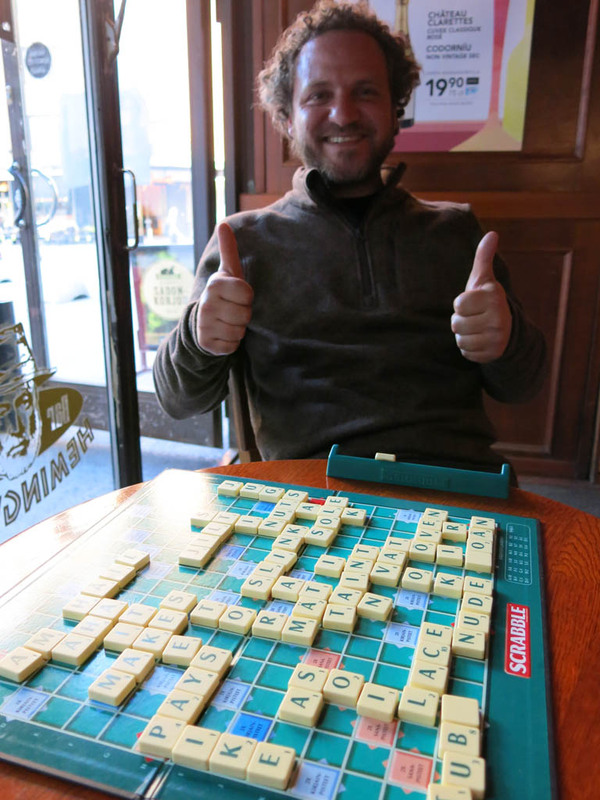 We found one that had a nice array of board games, so decided to get a bit of Scrabble action. Neither of us noticed until we started that we may be up for a slightly different game, with the letters being tailored to the Finnish language. Made sense! That didn’t stop us, as we made our own rules and tried to play. The array of letters made it quite difficult to buts out great words, but we had a successful game nonetheless. James was the quite convincing winner, however with a day of wandering in the glorious Scandinavian sun, with some Finnish beers under my belt, I was too worried. In fact, I was feeling pretty great.